…Except when you’re a business owner trying to usher new customers into the door. Whether you run a retail store, restaurant, or other brick-and-mortar shop, summer presents an opportunity to ride a big business wave. It’s a season when people are out and about– they’re more likely to walk by your shop, participate in community events, and try something new. Loyal customers are the ones who’ll spread the word, keep coming back, and ultimately help you be successful, but you need to create loyal customers in the first place. Summer is the perfect time to do it. Before you turn up your nose and say “parades are for babies,” consider how many people attend parades and celebratory events, especially in summer communities. 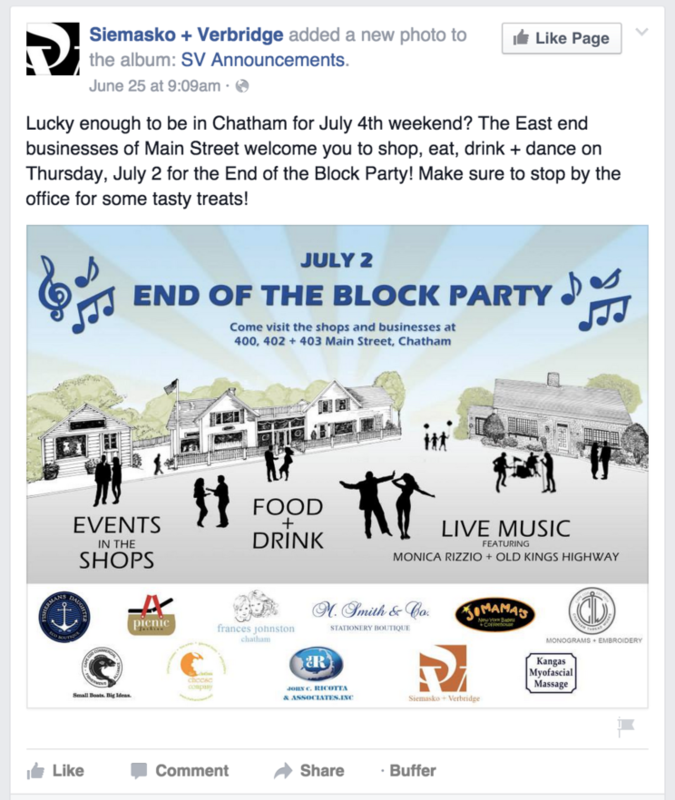 For example, in Chatham, Massachusetts on the famed Cape Cod, more than 20,000 people come into town for the 4th of July celebration. The festivities aren’t just a celebration of America– they’re also an opportunity for local businesses. Siemasko + Verbridge, an architecture and design firm that’s new to the region, gave away cocktails at their brick-and-mortar location during Chatham’s block party, hoping to connect with other local businesses, and hook in some new customers at the same time. The next day, the company set up a lemonade stand during the parade, connecting with new faces once again. Unlike tech companies, brick-and-mortar locations have something tangible to offer– physical space. Summertime is party-time, so share your true colors at an in-house event where you can show off your space. The trick to a great event? Getting people through the door. Make sure you show off who you are and what you can offer at your event. If you’re a restaurant, go out of your way to serve a ton of different foods to encourage people to come back. If you’re an architect, make sure you have portfolios handy to show off your projects. Depending on where you live, farmer’s markets and craft fairs only happen in the spring and summer. Not only that, they’re always jam-packed with people. If you sell anything edible or anything cute, beautiful, or visually-appealing in general, you should make yourself a hallmark at the local markets and craft fairs. Many local businesses attend a different fair each day of the week, ensuring that they get in front of as many new faces as possible, as well as reconnect with those they’ve already met. Even if you don’t sell tomatoes or homemade handbags, markets and fairs are an opportunity to connect with your local community, building brand awareness so that you become familiar to those who might buy from you in the future. Let’s face it– nothing brings a shopper into a store more than a sale. Summer is a great time to offer storewide savings and special deals on popular items, especially if you don’t have sales very often. Remember sales can encompass more than just clothing, accessories, and hardware– if you run a restaurant, have a $1 oyster night to draw customers in. If you run a local bank, offer deals for those who open new checkings and savings accounts. Your customers are outside enjoying the sun and seaside air, so you should be too. Going outside can mean different things to each business, so figure out how you can get yourself outdoors. Technology means you aren’t tied to a cash register. Apps like Square allow you to accept mobile payments from smartphones and tablets, so you can do business wherever you are. A restaurant can host an outdoor party, and offer outdoor seating. If there’s no outdoor space, special signs can be placed outside to encourage people to come in. A bank can have a teller at a table or booth on the street, making services more accessible and obvious to everyone who walks by. A yoga studio can host practice on the beach, in the park, or somewhere else that’s close to nature. A shop can put items outside on the street to show off wares, so that those walking by can browse. When it rains, it pours. In the summer, people tend to have tons of outdoor plans, but fewer for rainy days. When it rains, they’re likely to curl up on the couch rather than venture out. That’s where you can step in. If you run a pottery studio, restaurant, or gym, you can encourage new customers to come through your doors by offering rainy day specials. You can offer discounts, special classes, gifts, and other rewards. Summer is as good a time as any for partnerships. Local business is all about who you know in your local community. When someone asks a fellow shopkeeper for a bank recommendation, you want to be the bank they recommend. When someone asks a bank teller where to get lunch, you want your restaurant recommended. One of the best ways to do that is to provide exemplary product and services, but partnerships can go along way. Whether you partner with other businesses for events, sales, or something else, partnerships can offer a huge opportunity to get in front of new faces. There’s a reason pictures of puppies, kittens, and babies draw so many Likes on Facebook. People love cuteness, and summer is the perfect time to enlist children and pets to get new customers through the door. Children are off of school for the summer, so take advantage by hosting daytime events for kids and their parents or babysitters. You can host a home run derby, road race, or another family friendly that brings people together. 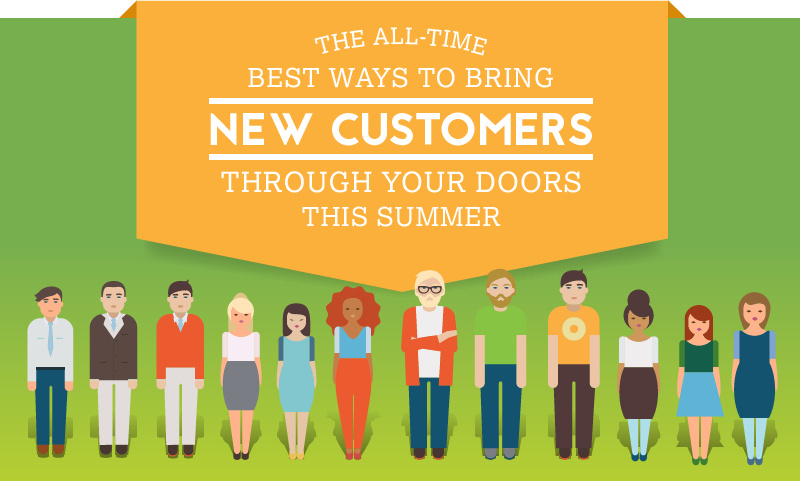 What other things are you doing to bring more customers through your doors this summer? Tell us in the comments section below!